STRUNG is an inspired exhibit. It combines the aesthetics of performance in new and challenging ways to explore concepts of crisis and sustainability in the world we live I today. 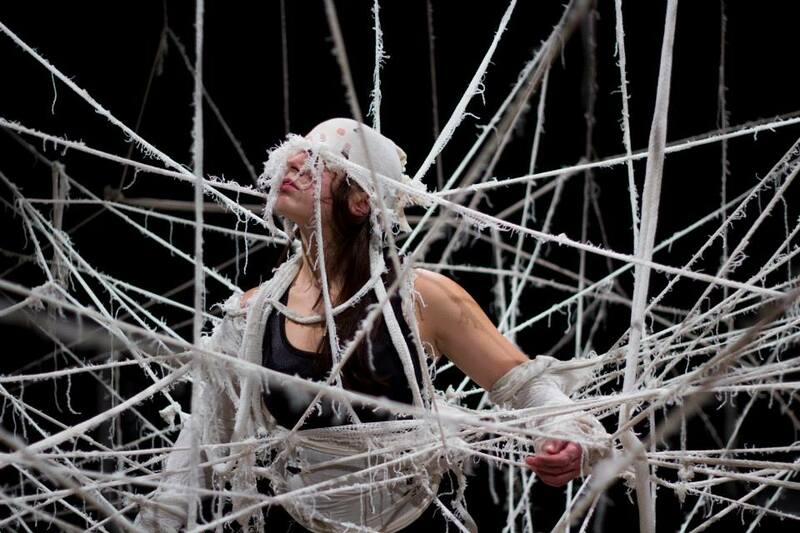 Audiences are invited to participate (having been suitably forewarned, ethics checklist: tick) and the atmosphere is one of intimacy, a sense of expectation is in the air and the edifice of off-white ribbons dangling from the roof create a mini-ecosystem in what is essentially a black box theatre space. People are gathered and welcomed into the circle and there is no official beginning: audiences know instinctively when the performance begins. Christina Kapadocha is the central performer of the work and her movements, instincts and responses are all watched carefully by those around her. Essentially she is central to this drama and as the audience impose, retract and participate in her story layers of meaning are constructed. In conjunction are the ‘active’ scenographers, those inviting the audience into the space and also ensuring the safety and in some ways the sustainability of the efforts of those participating in this construction. Tanja Beer, who is also responsible for the concept and sceneography works in partnership Ella Marie Fowler, Jacquie Holland all of whom through their own advances into the space offer new statements on the visible sculpting of space in ‘real time’. The end result left me, on a personal note feeling uncomfortable at the final result. This sense was due partly to my own sense of distress in visibly participating in a course of events that caused another human being (and yes, multiple belief systems are in operation) to be suspended in a way that I find intrinsically antithetical to my personal values. Inevitably as an audience we are being made complicit in an act of ‘stringing up’ an individual. Effectively, every person present is responsible for the ultimate grand finale: a woman (and I believe gender choices are important) caught in a white web of cause-and-effect responses. Interestingly, during the conversation and discussion afterwards Kapadocha spoke quite openly, and to some extent even defensively, that her own actions were always her own and that others interpretations were their right but ephemeral and therefore ‘real’ only in those moments. The emphasis seemed to be on the ultimate ‘effect’ of creating beauty out of re-cycled material and therefore the penultimate product was supposed to be centre of attention. However, the process of doing so is as if not more important. The story of how this recycled sausage netting (were vegetarians and vegans advised of this) was given new life is a laudable effort and shows great insight on Beer’s concept and her effort to examine sustainability in ways that challenge the status quo. But is that enough? Is sustainability as a construct (and an action) the solution to the environmental crisis we face? Is this dialectic as simple as it seems? Is there room for failure and therefore growth in these models or we simply reaffirming a linear hierarchy where consumerism continues to define the system in which we operate. The greatest strength of Beer’s work is that it is a provocation: it stimulates discussion, blurs the lines between art and the environment and challenges notions of passive and active audiences. Whatever one’s reflections, interpretations or conclusions, the message is abundantly clear each have a valid space in this continuously morphing landscape and it is very clear that this (whatever this may be) is NOT rubbish.